Just attended the Maison et Objèt show in Paris ... amazing and inspiring and, at times, overwhelming! everywhere you looked were signs in every language reminding you that photos were forbidden ... right alongside were folks snapping pics! I got a little braver as the day progressed and sneaked a few fuzzy shots of some of my favorite furniture pieces or color combinations. I grabbed this one because turquoise is the talk of the town and it was wildly on display here. 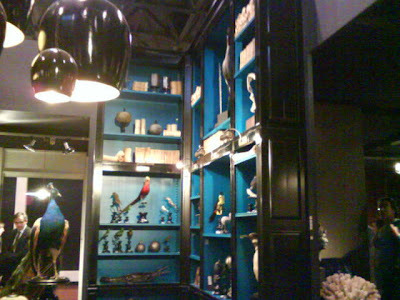 The photo doesn't quite do justice but its floor to (high) ceiling bookcases, stately form, black with bold turquoise interior. to wake it up even more? a fantastical collection of parrots in reds and blacks and jewel tones were interspersed amongst the books and other objèts. would make a tiny bibliotheque to die for. We're throwing a clearance sale to make way for all of the new pieces we've brought in to kick-off 2010! Take advantage of 25% OFF ALL 2009 furniture items. 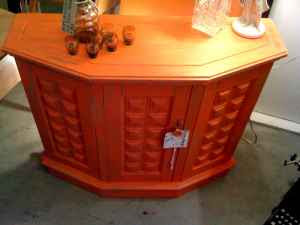 We have a variety to pick from ... tables, chairs, accent pieces and more. What's this about a Layaway Plan, you ask?! Well...say you see a piece that Johnelle has revamped in our shop and you love it, you want to take it home, but you feel it to be a little much of a splurge- we all have those days, right? Again.. you love it, it will serve a purpose in your home, and if only there was a way you could pay for it in two payments. Mignonne is big on client trust, so we have an agreement plan that will allow you to pay for the first half of a piece, take it home, and pay the second half within four weeks! Many of our clients have told us how much they appreciate the flexibility of this service. We are thankful for your support through the years and we are happy to be able to offer this plan for you! here's a fun little way to "toast" the New Year! 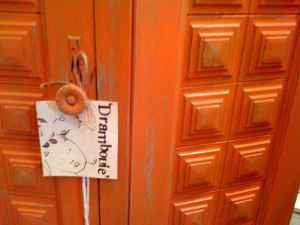 How about a sip of Drambouie ... a sweet little 70s table that's been given some punch! We love making the old new again ... this will be a cute conversation piece while adding some extra storage to a living room, family room or den! Remember, if you've got a tired old piece you were thinking you couldn't do a thing with ... shoot us a photo and we'll give you some ideas. We restore and transform your finds ... or you can visit us to check out our ever changing inventory of furniture in all styles and colors. Are you ready to spruce up your décor for the New Year? Want something unique that stands out from the usual box store options? Check out Mignonne Décor's ever changing variety of furniture, most selections are one-of-a-kind, hand-finished pieces that will bring life and pizzazz to your home. Whether it is a kitchen or side table, bureau, desk or chest of drawers ... we have beautiful items in store just waiting to grace your home. 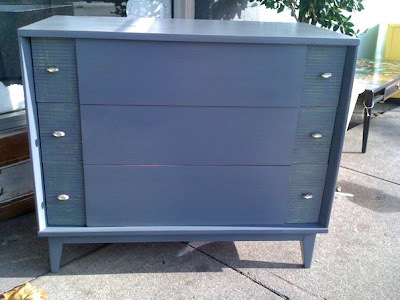 Check out this newest item ... a fabulously retro 60s dresser finished in a cool shades of charcoal, slate and some green undertones. Yours today for $350. 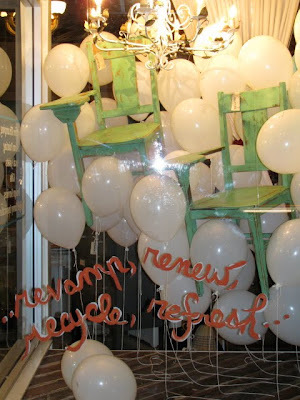 New Year's Resolution - Go Green! If being a little more friendly to Mother Earth is your aim in 2010, Mignonne Décor can help. Some New Year's resolutions can be a bit of drag (lose weight, quit doing your favorite thing, etc....) but at Mignonne you can have your cake and eat it too! We transform old, worn, cast-off furniture pieces into beautiful new design accents for your home. So recycling can be beautiful! Select one of ours or bring in your own ... get a jump start on fulfilling a resolution! We make it easy, affordable ... and gorgeous!